In a spray bottle, combine white vinegar with a teaspoon of dish soap which will make the vinegar stick to the weeds long enough to kill them. For maximum effect, it’s best to spray the weeds during prime hours for intense heat and sunshine, so the weeds will absorb the vinegar. You can either wait until the next day to remove the dead weeds or just dig them up alive. 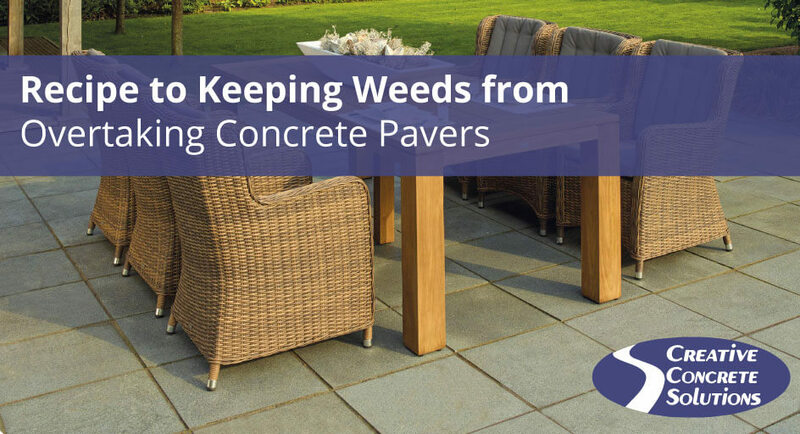 Before you can seal up your concrete joints, you need to make sure all the existing weeds are gone. You can either use your hands or a flathead screwdriver to pull them out. Once you are sure the only sand remaining is in the joints of the concrete, NOT on the surface, begin misting the concrete joints with a garden sprayer. You should put down 3 to 4 water applications over the sand. There are two important things to keep in mind as you do this. One: Avoid puddling. And two: Don’t wait more than 3 minutes between each application, so do small sections at a time to avoid letting the sand sit too long between watering. Once you’ve finished spraying, let your patio sit untouched for 24 hours. After sealing your concrete joints with polymeric sand, you should be protected from any weed flare ups. If you want to put an end to weeds in your concrete for good, contact our team at Creative Concrete Solutions. We can provide you the look of concrete pavers without the pesky joints that attracts weeds and bugs.